Ecuador has abandoned a pioneering conservation plan in the Amazon that attempted to raise funds from the international community instead of drilling for oil in a pristine corner of the Yasuni national park. The collapse of the Yasuni ITT initiative is a devastating blow for activists who are trying to save one of the world’s most biodiverse regions from development and pollution. It also kills climate campaigners’ hopes that the Ecuador plan could provide a model for other nations to resist the lure of oil money and leave fossil fuels under the ground. President Rafael Correa blamed the failure on the lack of foreign support, after a trust fund set up to manage the initiative received only $13m (£8.3m) in deposits, a tiny fraction of the $3.6bn goal. The president said the decision was one of the most difficult he had been forced to make since taking office, but preparations for a U-turn have long been under way and exploration is likely to begin within weeks. Correa said it would affect less that 1% of the park, but the termination of the conservation initiative has stirred up fury among environmentalists and is likely to upset the population at large. Polls show that between 78% and 90% of Ecuadoreans are opposed to drilling in this sensitive region. Kelly Swing, the founder of the Tipitini research centre in Yasuni, said the area affected by drilling could be 20 or 30 times more than the government has claimed once access roads are factored in. “A new road is the death knell to any wilderness area, no matter where in the world,” he said. Ecuador had won international praise in recent years for its seemingly progressive environmental policies, including the world’s first constitution that recognises the rights of nature, and the ITT initiative, which was widely seen as one of the boldest and most innovative approaches to conservation in the world. But the government is increasingly beholden to energy firms and China, which has extended generous loans to Ecuador backed by oil sales. 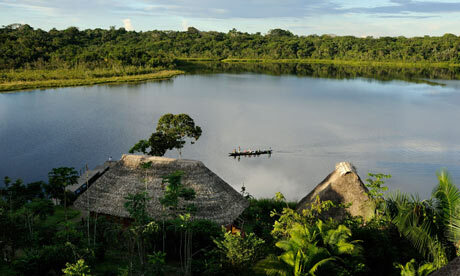 The initiative was set up in 2007 after drilling firms discovered 796m barrels of crude under the Ishpingo-Tambococha-Tiputini region of Yasuni. This is an area of the Amazon that contains more species in one hectare than all the wildlife in North America. Horrified at the environmental and climate implications, the country’s energy minister at the time, Alberto Acosta drew up an alternative proposal. The ITT initiative promised to leave the oil in the ground, thereby preventing more than 400m tonnes of carbon dioxide from going into the atmosphere, if half the $7.2bn value of the reserve could be raised by the international community by 2023. “It was not charity that we sought from the international community, but co-responsibility in the face of climate change,” Correa said in announcing the termination. Money was not given directly to the Ecuadorean government but administered by the UN development programme working with a board made up of indigenous peoples, local communities, academics and others. They had lined up hydroelectric and solar projects, as well as social programmes, for funding. The news appears to have taken the UN development programme by surprise. The organisation’s Yasuni website is still taking donations for the initiative. Although it was hailed as idealistic, there were several problems. Critics accused Correa of environmental extortion. Others were sceptical about what would happen to donations if the programme collapsed. While individuals – including Bo Derek, Leonardo DiCaprio, Edward Norton and Al Gore, as well as many members of the British public (who were the leading private contributors) – made generous donations, government level response was weak. Italy wrote off $51m of its external debt as a contribution, and Germany offered $50m in technical assistance to Yasuni rather than the ITT project. Chile, Colombia, Georgia and Turkey donated token amounts. Belgium, Brazil, France, Lebanon, Indonesia, Turkey, Spain and Qatar also promised donations. By the start of this year, pledges totalled $300m, according to its negotiators, but it is now apparent that only a fraction of that amount was actually deposited in the trust. Oil companies have been quietly preparing for the abandonment of the initiative. PetroEcuador has pushed ahead with development of extraction block 31, which sits on the edge of the ITT. Roads are also under construction close to the ITT project in an area that is famous for jaguar sightings. Acosta, who drafted the country’s constitution, stood against Correa in February’s presidential election, warning that the government’s environmental policies were under threat. Correa has debts to pay. Ecuador is unable to access finance on international markets. Instead it has sold more oil and borrowed more from China – both of which add to the impetus to exploit fossil fuels in the Amazon. Although pragmatic, the announcement is a blow to efforts to find alternative funding models for climate change policies and wildlife conservation in the face of increasing pressure from mining companies and farmers.